We've been big fans of Salomon's Deemax series of waterproof soft shell boots for daily use and light hiking ever since they came out, most recently the current version 3.0, on sale now at REI Garage for $109.73, down from $170.00. The Deemax has a speed lace, which are those dental floss-like thin laces that cinch tight fast but can loosen just as fast. The Deemax also has a power strap like a ski boot, a rip-and-stick (aka hook-and-loop aka Velcro), which provides welcome stiffness and backup to the speed laces. When the speed lace sawed through the upper fabric eyelet - a problem we had read about in various Salomon boot and shoes that use it, but over years of use never actually experienced - we looked around for a replacement and discovered that there was now another version of the boot, the Shelter. The Shelter differs from the Deemax in that it has a conventional thick lace with locking lugs at the top, a slightly shorter cuff and a somewhat cleaner design. After a couple months of wear we're happy to report that the Shelter is an equally fantastic boot that addresses the speed lace weakness and looks even better for daily wear around town here in Anchorage, Alaska. It is rated to 14F degrees, an on-paper improvement to the Deemax's 20F rating, but our subjective impression is that they're about equally warm. We wear both of them down to zero degrees F for hours at a time outside with no hesitation. The Shelter is a handsome boot that lives on our feet almost half the year, and we truly appreciate its warmth, waterproofing and traction in slick conditions. It breathes well enough that we leave it on our feet in the office for hours at a time. The Ice Grip soles are not magic on ice, but they perform at least as well as most rubber outsoles and are comfortable to boot. We still use our Deemax boots with just the strap for easy outdoor work like shoveling, chopping firewood and walking to the market. For everything else we use the Shelter, a great boot and now on sale at a great price. Deee-Lite says the groove is in the heart. True, but the warmth is in the feet if you're wearing Salomon's Deemax 2 Dry winter boots. When I was a kid I was stuck with moon boots and let's just say they weren't as cool as Napoleon Dynamite made them seem. The original Deemax was a handsome boot that outperformed its own specs, and I wore them just about exclusively for normal daily winter wear over three years in Anchorage, Alaska. It was one of the very few pieces of gear of any kind that I actually wore out. I took the plunge and bought the updated Deemax 2 when I saw them on sale at REI, and I'm happy to report they are just as good and maybe a little bit better even. The Deemax 2 Dry tips the scales at just over 2lb and is comfort rated to +20F thanks to 200g of Thinsulate. Temperature ratings are highly variable, but I tend to run a bit cold and yet I have no problem with these boots down into single digits. In fact, I normally wear them with just a liner sock because they're so warm. 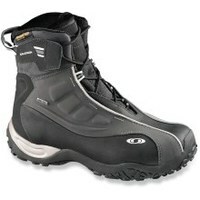 They breathe very well thanks to the snow-shedding waterproof welded soft shell. The Contagrip sole is lugged, grippy and stable and the speed lace system zips them right up. If you've felt the bite from these thin laces on Salomon's trail runners, have no fear: the padded tongue on the Deemax evenly distributes the pressure and is quite comfy. There's even a power strap that provides noticable extra stability when cinched down. There's a nice cut in the achilles tendon area that allows the foot to slide in fairly easily even though they don't open super far. That's good because the Deemax seems to run a bit small. Go a full size larger if you can't try them on before ordering, especially if you have high-volume sausage feet or like to wear thick socks. Really a fantastic boot from a company that knows footwear. 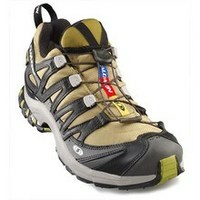 You gotta love Salomon shoes, and for absolute living proof check out the Salomon XA Pro 3D Mid LTR GTX. 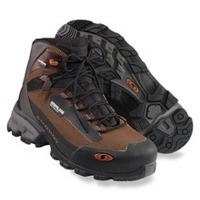 It's a trail runner, a light hiker, an approach shoe for nasty conditions. It's whatever you want it to be, and whatever you use it for you'll love it. The shoe has great waterproofing, an aggressive tread, the trademark Salomon speed laces that tuck up into a little mesh pocket on the tongue, it's all there. The mid-height construction gives you that little extra bit of protection and support for carrying a pack and overcoming challenging terrain. The shoe is exceptionally stable with a very low footbed. The sole extends out a bit from the midsole for extra stability, which is great when you're skating down a muddy trail in waterfall conditions. Throw some gaiters on and you're bombproof, Mt. Marathon here you come! Most people including me love their Salomons, but there are a couple of things to be aware of. For some reason Salomon shoes will sometimes get hungry and eat your socks. Synthetics work better than soft Merino wool, just be aware and give some time for breaking in. Also, as with any textile product, there is the occasional malfunction: laces breaking, sole separating, etc. Personally I haven't seen this any more with Salomons than with other brands. I did have a bad experience with a couple pairs of early model XA Pro 3D XCR low-tops, but I also own multiple pairs of Salomon boots (Deemax I love you!) that have been doing daily winter duty for going on six years with no problems. If you're looking for a multi-role, all-weather lightweight MMA fighter of a shoe that punches way above its weight class, you have to at least try Salomon's XA Pro 3D series before you die. I have something very painful to admit, but this time it doesn't require penicillin. Brace yourself: I used to wear moon boots. To those of you who don't know what those are, I have one thing to say: get off my lawn. Those of us experienced in the wearing of moon boots in arctic conditions know one thing: there is no way in hell those things kept astronauts' feet warm on the moon. We were deceived! Luckily we have more options these days, and at the top of that list should be Salomon's Tundra boot. Here's the skinny: mid/high length, nice furry cuff, basic reliable lug lacing system, waterproof, binding-ready with rubber nubs on the heel and oh-so-light at 3lb/pair. Fit is snug, so go up a half-size. -40F? At 3lb? True, true. The secret: Salomon's evil engineers went to Disneyland, captured Tinkerbell and forced her into a captive breeding program to produce hordes of fairies. They then ground these little bastards up, branded the resulting mixture as Aerogel and insulated the boot with it. Result: I had no problem comfortably trekking about at -20F with only a thin liner sock, and I know it can go colder. Thanks Tink! Not quite as fun as carpet-bombing small countries that can't fight back, Salomon's B52 is nonetheless a wicked warm snow boot. Actually called the B52 TS GTX I must omit the alphabet soup because it makes me want to hurl the contents of my stomach onto the nearest marketing executive. Bastards. Stuff your TS in your AH. The boot is nice, though, and light at 2lb 11oz for a pair of size 9s. Supposedly comfort-rated to both -40F and -40C - no, really, look it up - the Thinsulate 400 easily handles -20F standing around and colder temps if you're working. They're waterproof as advertised, which is critical for a winter boot since hypothermia when wet is more dangerous than much colder but dryer weather. The one-pull lacing works well, although it's a bit of a chore to store the lace-lock in the little pocket on the top of the tongue. The collar is nicely padded with a thick fleece, and the beefy grab-handle makes getting them on smooth. The proven Contagrip outsoles give great traction. Overall these do everything a winter boot should: warm, dry, comfortable and easy on/off. Hard to beat especially since you can find them on sale now. They're not listed online; call your local REI store and ask for item number 740886. Suffering from more than the normal share of "let's give every feature on the shoe a fancy buzzword and then put it all in the name" -itis, the Salomon XA Pro 3D XCR is nonetheless a great light hiker. Some people use it to run too, but there's no way to force them to get help until they hurt someone. As a light hiker they are indeed light at 30oz. They are waterproof as advertised, have a comfortable and secure footbed and the grip on the sole is excellent on dirt, mud and wet rock. The toe is armored too, a feature some shoes in this class give up. The big thing for me is the Quickfit Kevlar lacing system. It's more convenient than normal laces: just give it a yank, snug the coin-sized keeper up and tuck it into the elastic mesh pouch at the top of the tongue. I could definitely feel the narrow laces through the tongue when I really tightened them up for downhills, and though it wasn't exactly painful it may put some people off. I also had an annoying squeak develop in one shoe, so every other step on a hard surface drove me crazy. Other than that the XA is a high-performing and very comfortable shoe. Six-month update: I had to return the first pair because the squeaking got bad enough to provoke comments from total strangers. The lace on the second pair broke within days, so back they went. The guy at the return counter at REI said they get a lot of these returned, although there are replacement laces available. People seem to either love them or hate them, depending on whether they get a good pair or bad pair, or their tolerance for going through a pair every season. Salmon taste good Solomon was a wise king Salomon knows footwear and the Revo proves this right out of the box, with plush EVA midsoles and excellent light hiking performance. The Gore-Tex liners are highly water-resistant, but don't hang out cooling your dogs in that creek for too long or you will get wet. The Mountain Contagrip rubber outsoles have more grip than George Brett's pine tar bat, and the beefy rand will protect your delicate little pigs from incidental contact with the environment. At 2lb 10oz the Revos won't put excessive strain on your legs, and the reasonable price will likewise spare your wallet.